There are only two possibilities here in San Diego: STVRs (short term vacation rentals) are either “Visitor Accommodations” under the Municipal Code, or they’re not a listed use in the Municipal Code. In either case, STVRs are not permitted in residential zones under the Municipal Code for San Diego. For example, hotels, motels and bed and breakfast establishments are Visitor Accommodations. 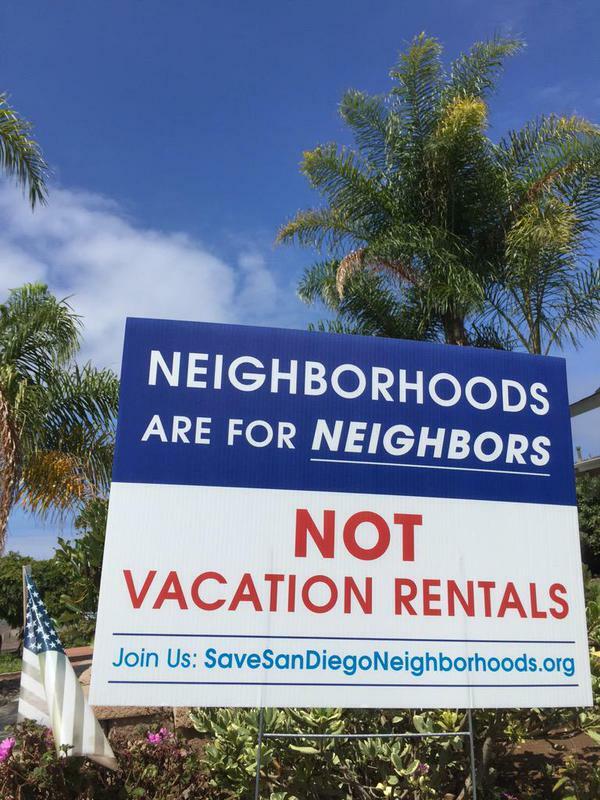 The Committee confirmed what San Diego residents already know (and what even Airbnb admits) –that STVR renters are visitors, and STVRs are visitor accommodations. Visitor Accommodations are unlawful in all residential zones. They are a non-conforming use. Then-City Attorney Michael Aguirre’s Office issued an opinion on STVRs in 2007 (written by deputy City attorney Shannon Thomas). It concluded STVRs are NOT Visitor Accommodations, as it concludes that because there is no definition for “visitor” in the Municipal Code, you can’t determine that the people who stay in STVRs are actually visitors. And because you can’t call them “visitors,” then STVRs are not “visitor accommodations.” Pretzel logic. Under the law, if a term is not defined in the Municipal Code, then the commonly accepted definition is to be used. Even Airbnb and STVR operators don’t deny their renters are visitors. And the City of San Diego levies the hotel occupancy tax (“TOT”) on the STVRs operators, having concluded that the renters are “transients,” a synonym for “visitors.” Go figure. Even if you conclude STVRs are not Visitor Accommodations, like marijuana dispensaries, STVRs are “not one of the enumerated permitted uses in the San Diego Municipal Code” and therefore are not permitted in ANY zones. City Attorney Goldsmith successfully used this argument to shut down medical marijuana dispensaries in 2011, claiming they were not a listed use in the SDMC. City Attorney Goldsmith’s opinion – that the City is prevented from enforcing the law because it hasn’t been enforced in the past – is unequivocally not supported by California courts. So there you have it. STVRs are either visitor accommodations and are illegal in residential zones, or they are not a listed use in the code and are illegal under the Code. The City Attorney has a legal obligation to enforce the city zoning laws, and the fact that he hasn’t for years is no excuse, legal or otherwise. Editor: This is a summary of a longer position paper. John Thickstun is a lifelong San Diego resident and a lawyer, practicing in San Diego for over 30 years. He is a member of Save San Diego Neighborhoods. Catch 22… Pretzel Logic (apologies to Steely Dan)… Damned if you do, damned if you don’t… Just collect the damn taxes which are extremely low and force other ordinances, such as noise, and everyone should be satisfied. STVRs are big business. Because it’s so profitable to own vacation rentals, the majority of STVRs are now owned by corporations. It’s no longer just you or I renting a room in our house or renting our house for a month while taking a trip. The knock-on effect is the reduced number of rental properties available for residents who live in San Diego and are looking for housing. It’s hard enough trying to make a living and find an affordable place to live in one of the most expensive cities in the country. If any doubt that this is big business, notice Airbnbs contributions to local political campaigns and the fact that Airbnb’s lobbyists and STVR lobbyists are showing up at all the City meetings to voice their support for STVRs in residential zones. Can you please tell me your source that says the, ” the majority of STVRs are now owned by corporations.” I simply cannot find any data to support this. This is exactly why many people are doing Airbnb. The average family income 10 years ago was $56K, now it’s $52K. 52% of Airbnb hosts depend on it to pay their rent or mortgage. If the noise issue, which is the main issue, can be controlled, then STRs should not be a problem for any neighborhood. Let’s see what kind of noise issues we have if the City imposes fines on noisy guests/owners. Noise is not the main issue in my opinion….it is the loss of neighbors. The only way to limit the loss of neighbors is too limit STVR’s…..if you rent out a room in your home to help offset the high costs of owning your home……WONDERFUL…..that does not take away from a rental or push out neighbors……..BUT….AIRBNB and VRBO do not want any compromise……they want it all…..THEY ARE GREEDY and are poisoning the minds of their homeshares to believe that there should be NO COMPROMISE. Look at the fight that is happening right now in SF between the communities and AIRBNB type businesses. Way to go Hotel Lobby! To borrow from another song…. the times, they are a-changin’. Municipal code often falls behind lifestyle trends. One of those trends is the idea of staying in someone’s home rather than a hotel. This is exactly why the code needs to be updated to reflect what thousands of San Diegans are already doing: renting out a room, or their whole home. It’s unclear why it has taken San Diego so long to update the code, especially as transients have been renting places to stay at the beach for about 100 years. That said, it’s never to late to get with the program, and that’s exactly what the City of San Diego has been trying to do for the last year. We support them in their efforts, and look forward to a common sense ordinance that protects homeowners and neighbors alike. Flexible living is here to stay. To not allow it would really infringe on homeowner rights. We also think that the City should allocate some of the taxes they are collecting from us for a small team of officers to ensure compliance with the existing noise, trash, or parking ordinances. To add to my own comment, it’s pretty clear a lot of people use cannabis, which is why the City has taken the time to update the code to allow MMJ dispensaries. Again, another change in our lifestyle, and one that is not going away. What the city did with cannibis is limit it to very few areas and very few dispensaries, so–for example– instead of there being more than 50 dispensaries in a coastal community such as Pacific Beach (which was the situation before), there are now something like 4 dispensaries in the same coastal area and they are located in industrial areas away from schools and homes, etc. If the City Council wants to cut down STVRs by some huge amount, with extreme limits such as what they did for cannibis, I think that would be one solution. But it’s a different issue. How can you approve some applications for a STVR and not others? In other words, how do you limit the number of them? The proliferation–and the percentage of them owned by corporate entities–is the real problem now. Yes, times are changing but do we want residential zones that were zoned to be neighborhoods to become hotel zones? That’s exactly what they are. If you google this issue, you’ll see that this is a HUGE problem not just in San Diego but throughout every major city in the U.S. Every city that’s a tourist attraction is dealing with it. What started as a really great thing—rent out your house for a month and make some cash–has turned into corporate big business. It’s the easiest and cheapest (and non-regulated) way to get into the hotel business, so corporate entities buy up properties and set up these ongoing “mini-hotels” in residential zones. It’s highly lucrative—much more than renting a property to a local resident by the month or year. Which is why it has turned into big business. MMJ has nothing to do with short-term rentals, but ok, let’s play your game. San Diego has taken almost 20 years to put regulations in place for MMJ dispensaries while shutting them down during that time. So each one of your short-term rentals is in violation of the current law and should be shut down accordingly and you should be held responsible for the fines, etc. When you’re prosecuted, you also won’t be able to open another short-term rental either, just as the MMJ dispensaries have had to endure. See ya in 20 years when the city works on proper regulations. It seems you are saying that stable neighborhoods, where neighbors help neighbors and participate in community, are part of a bygone lifestyle, which we old fogeys should quit trying to hang on to. That is sad, especially for us old fogeys. And slowly eroding the community as it has progressed. See: Mission Beach. So like.. a business in a residential zone? As opposed to the other homeowners rights who bought homes in NEIGHBORHOODS.. never expecting for mini-hotels to pop up next door. Because of course you’re not biased, co-founder of the Short Term Rental Alliance. How about the fact that your idea of the “future” is infringing on the rights of homeowners and renters who don’t want to participate in your greedy sham business. You wanna be a hotel/B&B owner ? Then buck up, apply for the necessary licenses in a area zoned for said business, carry liability insurance and go thru the required safety and health inspections. But that would involve actual effort instead of using some third-party website in a city thousands of miles away to do all the work because you’re greedy but lazy and care nothing about the community around you. Okay then……how about a compromise……other cities have done that along the coast. If you live on site you have a right to rent out a portion of your place….if you are off site you only can rent out for a max of 60 days…..and STVR’s are allowed in commercial zones already so that stays the same. BUT NO…….you people do not want a compromise do you……YOU want it ALL!!!!!! You are selfish and are only thinking of your pockets and not the community!!! If I sound to harsh then please comment back and tell me that you would go for a compromise???????????????? The author would have us believe that every time we host friends and family for a few days in our guest room, we are breaking the law, since according to the definition above, these friends and family (coming from a different state or city) would qualify as visitors or tourists. I would kindly suggest that the author lets legal experts provide legal opinions and keeps his own crude (and inaccurate) assessments for himself. with all due respect, I think you misread the article. Unless you charge your family and friends rent every time they visit you, this has nothing at all to do with that. This is about renting houses all the time for short term vacation rentals, and statistically now that’s done mostly by companies/corporate operators now, not just you and I renting our house for a short term . Go check out Save San Diego Neighborhoods website. It explains everything they stand for. I did and it was illuminating. I didn’t used to be on this side of the argument but after reading about it extensively and following the City meetings on the issue, I’ve realized that this is a big business fight against residents who don’t want their neighborhoods turning into hotel zones for commercial enterprises. By the way, even Save San Diego Neighborhoods has said publicly that they couldn’t care less about homeowners who rent a room in their house or occasionally rent their house out, etc. –that’s not the problem. Those aren’t the “offenders” that are destroying neighborhoods. Get beyond your gut reaction and read about this issue with an open mind, is what I’d say to everyone who cares about this issue. I disagree with the author about the law. You can’t compare a civil infraction like engaging in a legal business without the proper permit (which the city does not have a procedure to issue for AirBNBs) to a violent felony like burglary. Also, if you want to talk about property owners in violation of muni regs, have a look at the SD fence regulations, then walk around OB for an hour. I’d say about 80% of front fences are in violation. Most people don’t care as long as you are not affecting your neighbors negatively. Polla, that’s the problem here. STVRs are definitely affecting the neighbors negatively. Very negatively. The article is about STVR’s, not fences. Try and stay on topic. For almost a decade the city government has turned its back on it’s citizens (and municipal code) and allowed the mini-hotels to proliferate. Literally thousands of San Deigans have had their lives impacted by unruly, inconsiderate visitors to whole house rentals where there is no supervision or control on bad behavior. It is one of the most stressful and disturbing things that can happen to a neighborhood. Mayor Faulconer, in his inaugural address talked neighborhoods, neighborhoods, neighborhoods but he has been instrumental in helping the solution of our city by the vacation rental business. It is time for the citizens to make their voices heard and for the city government to listen. We do not want to turn our neighborhoods into hospitality zones. Put the Hotels where they belong in properly zoned areas. This is an issue that concerns me far more than planes flying over wealthy point lomans. I wish half of those people would show up to a meeting to protest the proliferation of full-time short-term rental conversions. I’m sick of watching my friends and neighbors get evicted to make way for obviously illegal b&b conversions. And it’s happening SO fast. Don’t believe the hype of the “regular folk” army of airbnb users like Belinda. They are a small fraction of users being mobilized by companies like airbnb to spread misinformation. Just look around you. That’s all the “source” you need to see apartments being converted. There should be exceptions for those who live on site, or are gone for the summer (a short-term), and anything else should be considered what it is, a HOTEL. We are not the only community dealing with this problem of professional landlords taking over long-term renters and affordable housing stock to increase their own profits at the expense of commUNITY. SVTRs should be limited to rooms in owner occupied houses and second units on owner occupied property. Keeping the “Owner Occupied” clause intact would solve a lot of the issues. Belinda, your organization’s members likely have giant piles of cash laying around and probably should maintain a 24/7 help line for the many neighbors who’s lives are destroyed by animal house STVRs. It would be in your best interest to control your members, because no one else seems to be able to do so…Maybe we could just call your cell, I am sure you leave it on at night for your STVR tenants and surrounding neighbors in case something goes wrong, right? Thursday, Dec. 3 | 9 a.m. Please plan to attend a critical Planning Commission meeting at 9 a.m. on Thursday, Dec. 3 on the 12th floor of the City Administration Building. The City’s draft ordinance – which would allow STVR mini-hotels in ALL residential zones in San Diego – will be the topic. A public comment period is scheduled, but attendance will be heavy by STVR supporters, which is why we need your support. If you need a ride, we will be offering limited rides to downtown.